Junior defenseman Ryan Shea has been drafted by the National Hockey League’s Chicago Blackhawks. At 21, Ryan Shea has already played a lot of hockey. A three-year starter and captain during 2014-15 season at Boston College High School, the 21-year-old Shea is now a starting left-shot defenseman for the eighth-ranked Northeastern men’s hockey team. 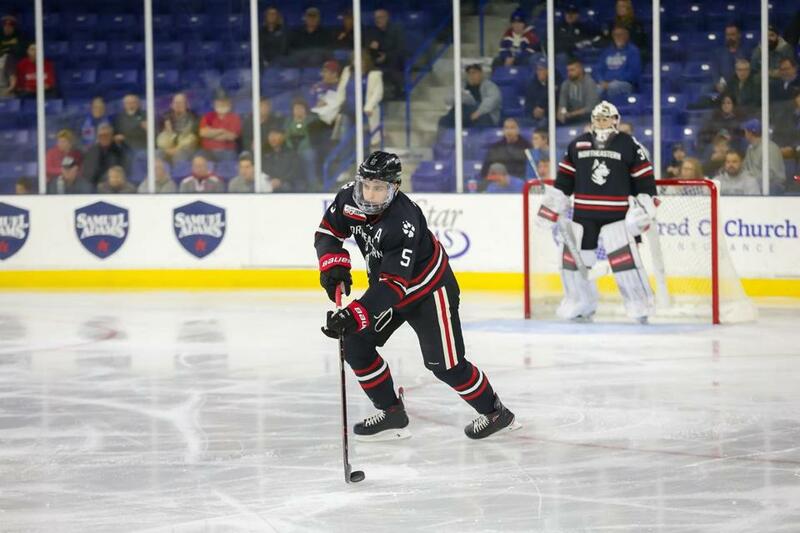 In between, the Milton resident skated for the Cape Cod Whalers U18 team and a season with the Youngstown Phantoms of the United States Hockey League. In 2015, Shea was selected by the Chicago Blackhawks in the fourth round of the NHL’s First-Year Player Draft, with the 121st overall pick. His father, Dan, was a four-year player at Boston College (1984-88), racking up 69 goals and 121 assists. In 19 games this season, the 6-foot-1, 190-pound Shea has a team-leading 37 blocked shots, has registered 8 assists, and is a plus-18 overall. With a matchup this weekend against top-ranked University of Massachusetts Amherst on the docket, and in advance of the 2019 Beanpot, he took a few minutes to chat with the Globe. During the 2015-16 season, in Youngstown, you suffered a pretty bad injury. How did you overcome that, and, at the same time, try to improve? A: I broke my collarbone twice. The second time I was really down on myself but I think that has helped me mature as a player and a person, and I think even though I couldn’t skate or do everything all the boys were doing, I still had to show up to the rink every day, ready to go for rehab or whatever was on the agenda that day just to try and get back in the lineup as quick as possible. What was the USHL experience like? A: At first it was a little strange, you go out there and you live with obviously not your real family, a family brings you in and treats you like one of their own. That was nice and a little different but once you get comfortable, I’d say the end of the first month, it was kind of like you were like a professional. You’re on your own, you’re just with the guys on the team, going to the rink for practice. I did school out there so I had that to do too. It’s pretty much treating yourself like a professional out there and maturing along the way. Describe the day the Chicago Blackhawks selected you in the NHL draft? A: Probably one of the best days of my life so far. I watched it actually by myself in my basement but once my name came up on that board, I started interacting with my family, all my buddies came over. We’re really close with [Milton native] Keith Yandle of the Florida Panthers, so he came over and it turned into a little bit of a celebration. It was a special day. What’s it like to get to stay in your home state and be a part of a top program? A: One of the best reasons is having your family come and watch every game. I mean I don’t think my dad has even missed a game. He even came out to Michigan State when we played out there my freshman year so I think that’s definitely something special, with my aunts, uncles, and siblings too. That was definitely the number one reason why I chose Northeastern and because of my relationship with the coaches. Coach [Jim] Madigan is also a Milton guy so I knew him before and I just thought that they could bring the best out of me and develop my skills for the next level. Northeastern is coming off its first Beanpot win in 30 years. What is the mind-set this year? A: Now that we have that one win under our belt, we know what it takes and we have a bunch of veteran guys that were here last year. . . . It’s one-game elimination so you’ve got to give everything you have at every point during the tournament. Your dad played hockey at BC, is there a rivalry there? A: No. I just thought the best fit was Northeastern and he respected that — it was my decision. He has his legacy there and I kind of wanted to build my own so that’s why I chose a school like this. I definitely joke around with him because he was at BC for four years and was in the Beanpot championship multiple times but he never won. What’s the hardest class you’re taking now? A: I’m a business management major, so I just took MIS which is Management Information Systems, so I’d definitely say that or business stats so far are the hardest that I’ve taken. A: I mean I want to play hockey as long as I can. I think a business major from Northeastern will set me up for a good opportunity. I think I’m an open-minded kid. . . . I’m just trying to get the best grades possible because obviously hockey doesn’t always pan out for people.